WILMINGTON, Del. — A man charged in connection with the shooting of a 10-year-old boy early Tuesday in Wilmington recently spent nearly a year on probation after being caught with a loaded handgun, court records show. The case was still open when Jaleel Goldsborough, 24, was arrested Tuesday afternoon after the shooting in a brick row house in the 700 block of Townsend Place. Goldsborough was wanted for contempt of court because he had not paid an outstanding fine several months after being discharged from probation as “unimproved,” court records indicate. He had been sentenced in October 2013 to five years in prison by a Superior Court judge for carrying a concealed deadly weapon, but the prison term was suspended for one year of low-level probation, documents show. The victim Tuesday, identified by relatives as Makhi Mitchell, was shot in the head at about 1:50 a.m. and taken to Nemours/Alfred I. duPont Hospital for Children in Rockland. He was listed in critical but stable condition after surgery, Wilmington Police Master Sgt. Shane Sowden said Wednesday. Police have released few details in the shooting, including where the victim was. Alexandra Coppadge, a spokeswoman for Mayor Dennis P. Williams, on Wednesday backed off a statement she made Tuesday night that investigators had identified several other suspects in the shooting. 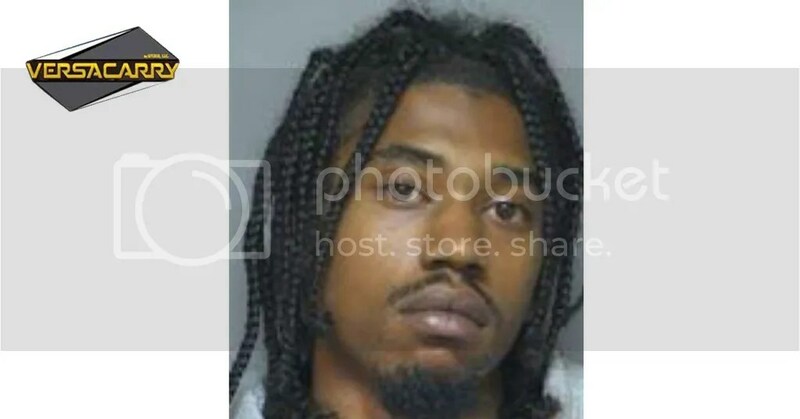 In the Tuesday shooting, Goldsborough is charged with possession of a firearm by a person prohibited causing injury or death to another person. He has not been arraigned on the charges yet, and all court records and police affidavits have been sealed. In the previous arrest on Aug. 28, 2013, Goldsborough was found with a 9mm Beretta pistol in his pants and 22 grams of marijuana in his sweatshirt pocket. An ammunition magazine held nine bullets and he had $567 in cash, the warrant said. According to the warrant, Goldsborough had his “right arm secured to his body and his right hand firmly placed to the middle of his body as if was keeping a firearm in place.” Goldsborough told police he “found the firearm four years ago” and was carrying it because he didn’t want to get robbed of the money he was carrying, court files show. After his 2013 arrest, Goldsborough spent five days in prison before posting $10,000 bond. That October, he pleaded guilty to the concealed gun charge and prosecutor Matthew B. Frawley dropped the marijuana charge. At sentencing, Frawley recommended a five-year suspended prison term with one year of Level II probation, which calls for about one meeting monthly with an officer. That’s the sentence Judge John E. Babiarz imposed. Babiarz also levied a $500 fine and $317 in court costs. In June 2014, though, a progress report from probation officer Jacob P. Selba urged the court to order Goldsborough to have a substance abuse evaluation and follow recommended treatment. Judge Diane C. Streett agreed to the request. In September, 11 months after his sentencing, Selba filed another report and Street discharged him from probation as “unimproved.” He was discharged even though he still owed $767 in fines and court costs, records show. In May, Goldsborough still had not paid the fine and was charged with contempt of court. A warrant was issued for his arrest. Goldsborough also has a previous conviction for driving while suspended, but a 2008 pot dealing and possession charge was dropped when he agreed to a drug diversion program. Authorities said this week they asked the court to seal the arrest warrant and search warrant for Goldsborough “because there is information in them that police and prosecutors believe could jeopardize their ongoing investigation if released at this time,” said Department of Justice spokesman Carl Kanefsky. Sowden on Wednesday said the case is considered a “shooting/assault investigation” but declined to elaborate. Police said they received conflicting information about how the shooting happened and little is being disclosed “to protect the integrity of the investigation,” Sowden said. The victim is the 12th juvenile to be shot this year in Wilmington. The brick building, managed by the Wilmington Housing Authority, and was the scene of a shooting in April in which a 31-year-old man was wounded multiple times. City Councilwoman Hanifa Shabazz said Wednesday she feels area residents can “rest assured the shooting was not random,” even though police have not said as much. Police have not given her any additional information, she said.